^ Dorit，Walker & Barnes 1991, p. 847. ^ Barthalmus, G. T.; Zielinski W. J. Xenopus skin mucus induces oral dyskinesias that promote escape from snakes. Pharmacology, Biochemistry Behavior. 1988, 30 (4): 957–959. PMID 3227042. doi:10.1016/0091-3057(88)90126-8. ^ Crayon, John J. Xenopus laevis. AmphibiaWeb. [2012-10-08]. ^ Moodie, G. E. E. Observations on the life history of the caecilian Typhlonectes compressicaudus (Dumeril and Bibron) in the Amazon basin. Canadian Journal of Zoology. 1978, 56 (4): 1005–1008. doi:10.1139/z78-141. ^ Brodie, Edmund D. Jr. Investigations on the skin toxin of the adult rough-skinned newt, Taricha granulosa. Copeia. 1968, 1968 (2): 307–313. JSTOR 1441757. doi:10.2307/1441757. ^ 6.0 6.1 Hanifin, Charles T.; Yotsu-Yamashita, Mari; Yasumoto, Takeshi; Brodie, Edmund D.; Brodie, Edmund D. Jr. Toxicity of dangerous prey: variation of tetrodotoxin levels within and among populations of the newt Taricha granulosa. Journal of Chemical Ecology. 1999, 25 (9): 2161–2175. doi:10.1023/A:1021049125805. ^ Geffeney, Shana L.; Fujimoto, Esther; Brodie, Edmund D.; Brodie, Edmund D. Jr.; Ruben, Peter C. Evolutionary diversification of TTX-resistant sodium channels in a predator–prey interaction. Nature. 2005, 434 (7034): 759–763. PMID 15815629. doi:10.1038/nature03444. ^ Stebbins & Cohen 1995, p. 110. ^ Patocka, Jiri; Wulff, Kräuff; Palomeque, MaríaVictoria. Dart Poison Frogs and Their Toxins. ASA Newsletter. 1999, 5 (75) [2013-01-29]. ISSN 1057-9419. 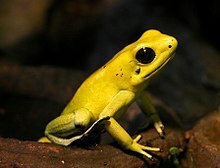 ^ Darst, Catherine R.; Cummings, Molly E. Predator learning favours mimicry of a less-toxic model in poison frogs. Nature. 2006, 440 (7081): 208–211. PMID 16525472. doi:10.1038/nature04297. ^ Brodie, Edmund D. Jr.; Nowak, Robert T.; Harvey, William R. Antipredator secretions and behavior of selected salamanders against shrews. Copeia. 1979, 1979 (2): 270–274. JSTOR 1443413. doi:10.2307/1443413. ^ Beneski, John T. Jr. Adaptive significance of tail autotomy in the Salamander, Ensatina. Journal of Herpetology. 1989, 23 (3): 322–324. JSTOR 156446. doi:10.2307/1564465. ^ Arnold, Nicholas; Ovenden, Denys. Reptiles and Amphibians of Britain and Europe. Harper Collins Publishers. 2002: 13–18. ISBN 978-0-00-219318-4. ^ Brodie, E. D. Jr. Biting and vocalisation as antipredator mechanisms in terrestrial salamanders. Copeia. 1978, 1978 (1): 127–129. JSTOR 1443832. doi:10.2307/1443832.